Wow…as the end is near on this journey to drink 365 beers, I can’t believe tonight’s beer, #354, will be my 18th I have had from Dogfish Head. 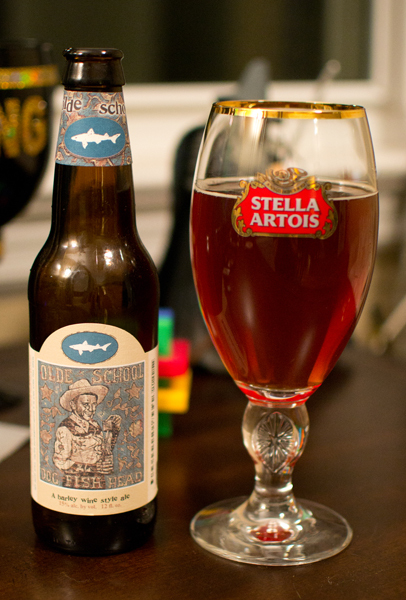 Olde School is that 18th beer and it is a American Barleywine with a hefty ABV of 15%. I have said it numerous times before, Dogfish tends to do nothing on the subtle side. I broke out a glass I haven’t used in a while, my Stella Artois glass from a fellow blogger for the pour. It had a slightly hazy amber color with hints of ruby red to it. The head was the smallest of off-white rings. I smelled booze, brown sugar, and raisins. Man…was this sweet and very boozy in the taste. There was the familiar flavor of caramel malts and a woodsy earthy thing going on in here. Add in a dark cherry flavor very reminiscent of cherry flavored NyQuil and there you have it. It had quite the warming effect from the high ABV. It was quite thick and syrupy with the carbonation on the low side. For me and I imagine anyone who drinks this, it was a sipping brew. For me, this was just OK. I’m not a big fan of Barelywines in general (although I have found some that I do enjoy) and this did nothing to change my feeling on them. It really wasn’t what I was looking for in a beer this evening but it is what came up in the rotation. Speaking of which, I am out of beer and need to make my final beer run for this 365. There is nothing like a tulip glass to accentuate the head of a beer that has a good one and this was a good one indeed. That head was off-white and thick sitting on top on the dark reddish amber liquid. 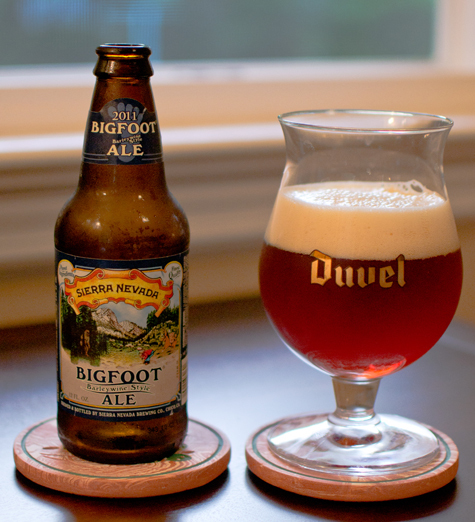 The aroma was thick with the smell of caramel malts and thick with hops…pine and grapefruit. Odd for me in that I was liking the nose quite a bit since I’m not a huge Barleywine fan. I have to say…this smelled really, really good. I took a sip and those sweet caramel malts jumped out at me right off the bat. They follow through right until mid mouthful when the hops took over with quite a bit of bitterness and a big pine like taste. This was a heavier bodied brew a bit sticky and syrupy…talk about coating the mouth, this does that for sure. The carbonation was nice…not too little or too much…just right. I took my time with this, savoring it. One thing that struck me funny was that the high ABV was hidden really well. Without a doubt this is my favorite Barleywine. For me is was super drinkable. It didn’t have that stomach sickening sweetness I usually get with this style. The malts and hops mix was just about perfect for my taste. Fantastic beer indeed. I may have to get a few of these and store them in the cellar as I hear that is all the rage. I found another New Jersey brewer that I didn’t know about. This brewer is based out of Roselle Park, New Jersey and the name of that brewer is Climax Brewing Company. Climax has been brewing since 1996 and was founded by Dave Hoffmann and his dad, Kurt Hoffmann. 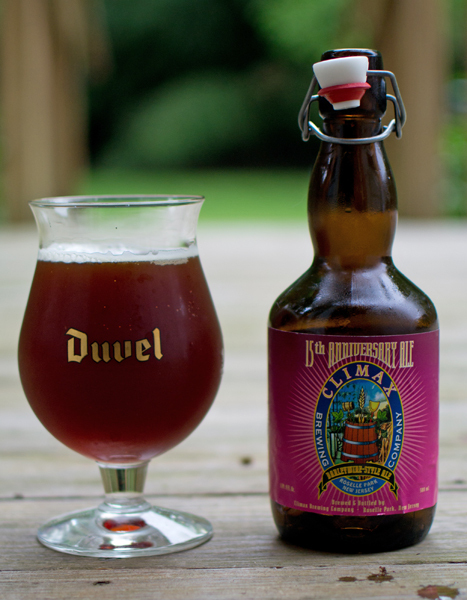 Beer #167 will be 15th Anniversary Ale by Climax Brewing Company. This American Barleywine, ABV of 10.5%, is brewed to celebrate their 15th anniversary of brewing in the state of NJ. Into my Duvel tulip went this beer and it had a color of dark amber with a red tint…sort of looked like iced tea (not the actor…). There was no head to speak of…darn. The nose was cherries, raisins, alcohol, and a bready malts. This was a bit sweet taste wise with flavors of molasses and caramel and some nice dark cherry. It finished a bit on the dry side. The mouthfeel was on the heavy side being sticky and kind of syrupy. The carbonation was low. The alcohol is very noticeable so this is a sipper for sure. I was feeling the alcohol content…and was probably a bit tipsy in writing this. I’m not a huge fan of Barleywines…they are usually stomach sickening sweet to me. This was not though…I enjoyed this quite a lot…so much I feel it was the best Barleywine I have had to date. This was an excellent brew. Cheers! Oh yeah…lets go Yankees…best them Red Sox!!!! Beer #99, Nemesis 2010, is my last beer from a fellow blogger from the midwest, Scot (http://blog.twobeerdudes.com/). 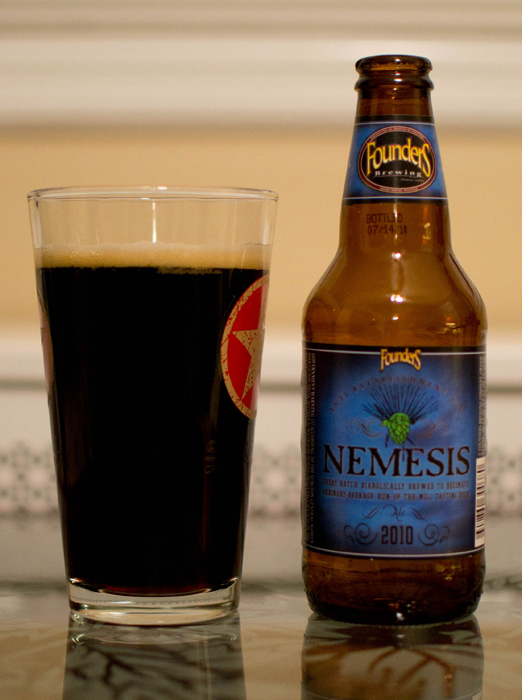 Nemesis is brewed by Founders Brewing Company (from the great state of Michigan) in the style of an American Barleywine with a whopping ABV of 12%. I broke out the Starr Hill pint glass (I need more glasses…I know) and gave it a pour. It was nearly black but when held up to the light it had some nice deep dark red hues to it. It was capped off with a small tan head. Up to the nose went the glass and there were aromas of molasses, dark roasted malts, chocolate, and a bit of booze. I took a sip and there was a ton of dark roasted malts, caramel, and chocolate here but the sweetness of some sort of fruit, almost like fig newtons or raisins, also comes through loud and clear. The mouthfeel was bordering on heavy with a smooth and creamy feeling. The drinkability for me is rather low with the high alcohol content and a sweetness that is just a bit much. That sweetness is almost sickening to me. I took my time with this one, probably far longer than I should have. I have said in the past that barleywines are not my favorite style and I think it has to do with the fruit sweetness I get in them that just doesn’t sit well with me. That being said, it was the best barleywine I have had to date. Out for dinner to our favorite Thai place usually means a quick run into the liquor store next to it. The label drew me to this particular beer with Kokopelli depicted on it. The deity of fertility, Kokopelli, reminds me of the vacation I spent with my wife in Sedona, AZ a number of years back. Good times. With a goofy smile on my face, I grabbed the bottle, paid for it, and joined my wife next door at our favorite Thai restaurant. 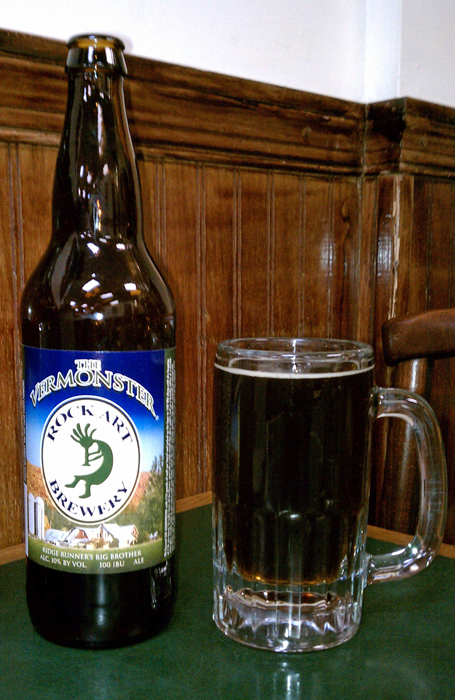 Beer #76 is Vermonster by Rock Art Brewery. 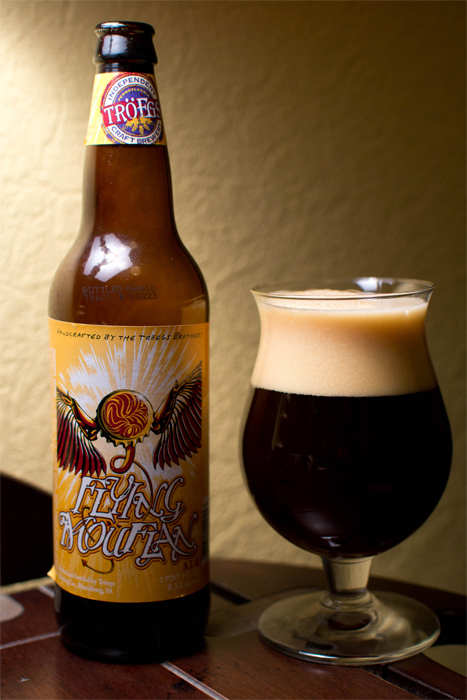 Rock Art Brewery hails from Vermont and brews the Vermonster in the style of an American Barleywine. The ABV comes in at a hefty 10% along with an IBU of 100…can you say strong and bitter? Into the restaurant mug it went with a dark brown color with a tiny head that didn’t last. The nose was lots of hops (pine scent) and a bunch of caramel malts. I took a sip and was rewarded with the some nice sweet malted goodness followed by quite a lot of hoppy bitterness. I also got some dark fruits (maybe cherries?) that I didn’t pick up in the nose. Mouthfeel was a bit heavy and sticky with some nice carbonation. It was a sipper for sure as I could feel the alcohol content as I was drinking it. I’m still warming up to Barleywines. While not my favorite style, I think I’m starting to appreciate them more and more. I like their hoppy bitter bite but the sweet thick maltiness sometimes doesn’t sit with me all that well. That being said, this beer was OK. I don’t think it was the perfect beer for our Thai dinner as it was a bit thick but I did notice it cut the heat of the spicy food better than the glass of water did. 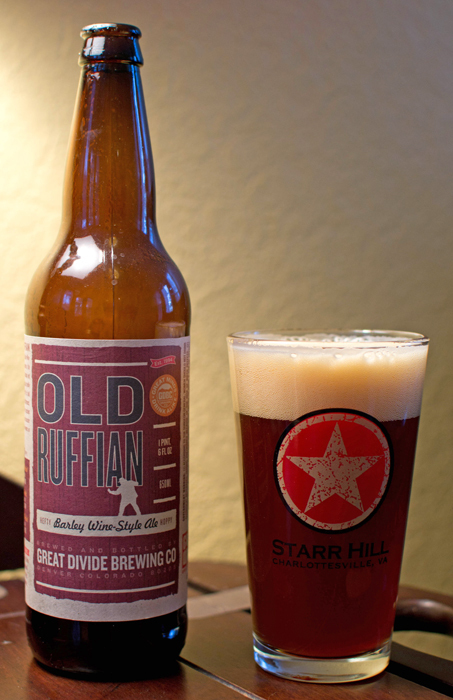 Beer #56 is Old Ruffian by Great Divide Brewing Company. This is my 2nd American Barleywine (maybe I will like this one better?) in the last 3 days. The ABV comes in at a hefty 10.2%. The bomber (22 oz.) was chilled, the Starr Hill glass clean and into it went the Old Ruffian. It looked really nice, a reddish brown with a lovely white head. I dipped my nose into the glass and smelled some caramel, raisins, lots of sweet malts, and quite a bit of hops (think pine). This was a sweet malty brew with a nice hop bite at the end. Super smooth, it felt like it coated the tongue. The alcohol was hidden well for a beer with 10.2% ABV. This is one to take your time with due to the higher alcohol content and for me, the sweetness. Overall a nice beer…I like this better then the Mouflan. Maybe these Barleywines are starting to grow on me. Definitely best served in winter. Summer…not so much. Beer #54 is The Flying Mouflan by Troegs Brewing Company. The Mouflan is an American Barleywine…my first ever. The ABV clocks in at 9.3%. This is going to be short and sweet as I am half in the bag with this Barleywine and Baileys Irish Creme (in a few coffee drinks) flowing through my system. You just have to love Friday nights! Appearance was a dark brown with a ruby red color as I held it up to the light. I loved the head on this one, big, fluffy and tan. It left some great lacing on the glass during the whole drink. Nose was sweet malts, caramel, raisins and booze. Lots and lots of booze. The taste was not nearly as pronounced as the smell, I really didn’t get much of what I smelled in the taste. It started sweet and finished slightly bitter from the hops. Again…lots and lots of sweetness. It was super smooth in the mouth, a bit heavy, almost sticky, with just a bit of carbonation. The alcohol was very present and warmed me up as it was going down. It was a sipper indeed. I wasn’t quite sure what to expect from a Barleywine but I do have another lined up that I can compare it to. Overall it was a decent beer. It wasn’t my favorite from Troegs, although maybe it just isn’t my favorite style of beer. Maybe it was the Baileys clouding my mind and judgement. Maybe it was the Mouflan. Or maybe it was both.